We want to take some time to focus on our students and get to know them and the amazing things they are doing. Meet Mike Acquafredda! He won the student award at our MAC annual meeting in October and has been involved in a wide variety of research. What made you get into your line of work? 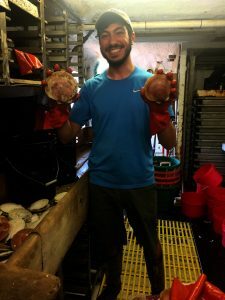 Mike: I’m currently a PhD Candidate at the Rutgers University Haskin Shellfish Research laboratory. My dissertation research is broadly focused on ways to diversify the Northeast’s aquaculture sector. Aquaculture is a perfect marriage between my two greatest passions: marine biology and food! I first learned about aquaculture and became interested in the field when I organized an oyster gardening program for my Eagle Scout Project. What did you do before coming to work at the Haskin Shellfish Research Lab (HSRL)? Mike: Before starting graduate school at HSRL, I was an undergraduate at Tufts University. At Tufts, I worked in two separate laboratories conducting independent research with Dr. Kelly McLaughlin. I studied heart development and heart disease in the amphibian model species, Xenopus laevis. With Dr. Jan Pechenik, I studied the effects of hypoxia on a pollution-indicating polychaete, Capitella teleta. What is (or has been) the most rewarding part of your job? Mike: The most rewarding part of my job is knowing that my research is helping to support the aquaculture sector, which is the fastest growing part of the food industry. What is the one thing on your bucket list you’d like to accomplish in the next five years? Mike: In the next five years, I hope I can scratch off swimming with stingless jellyfish in Palau from my bucket list. Mike: My favorite holiday is Christmas Eve. In my family, we celebrate Christmas Eve with a smorgasbord of seafood. It’s an Italian tradition known as the Feast of the Seven Fishes. President-Elect Michael Greco, better known as “Grec” by his co-workers. Mike received his B.S. in Fisheries Mgt. and Wildlife Mgt. from Delaware State College (now University) in 1991. 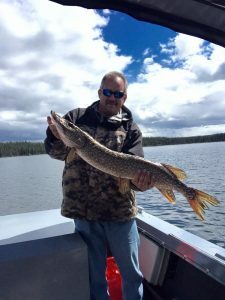 He started with the Delaware Division of Fish and Wildlife in 1992 as a seasonal advancing to Environment Scientist IV in 2012. Mike currently serves as the project leader for the Division’s juvenile and adult trawl surveys and the Division’s oyster survey. He also represents the Division on a number of technical committees for the Atlantic States Marine Fisheries Commission including, but not limited to, Weakfish, Atlantic Croaker and Spot. In addition, he is the Division’s representative on the National Marine Fisheries Service take reduction teams for Bottlenose Dolphin, Harbor Porpoise and Atlantic Large Whales. He has been a member of AFS since 1991 and obtained his AFS certification in 2012. Professionally, his interest is in field work (isn’t everyone’s) and fish ageing. Outside of work, he is active with a local volunteer fire company since 1993 where he has served as Fire Chief (2010-2016) and President (1998-2002) in addition to other administrative and fire line officer positions. He is an avid Philly sports fan, especially Flyers hockey. Error: Error validating access token: Session has expired on Tuesday, 26-Mar-19 05:03:35 PDT. The current time is Saturday, 20-Apr-19 22:12:11 PDT.